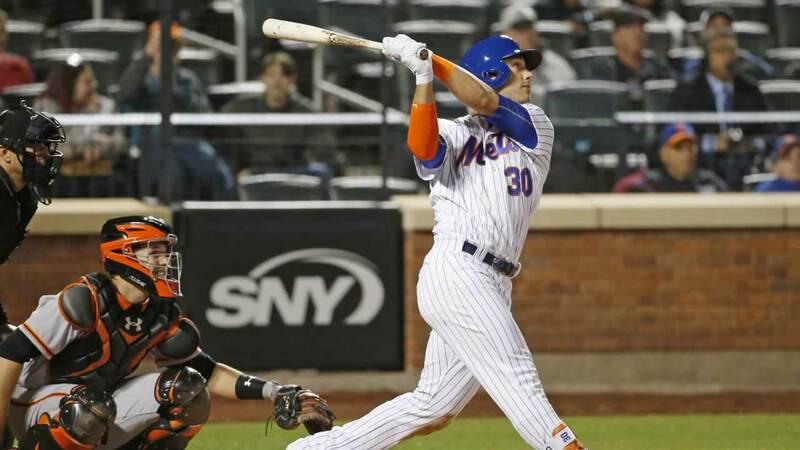 NEW YORK -- Zack Wheeler pitched two-hit ball against the team that traded him, Michael Conforto homered and the New York Mets scored four times in the first inning Tuesday night on the way to a 6-1 victory over the staggering San Francisco Giants. Hours after an embarrassed Matt Harvey returned from his three-day suspension with a string of contrite apologies, the banged-up Mets began moving on from their latest commotion. Despite all the injuries and turmoil, New York (16-16) has righted itself on the field by winning eight of 11 following a six-game slide. Jeff Samardzija (0-5) and the Giants, outhit 13-2, are headed in the opposite direction after their fifth consecutive defeat and eighth in 10 games. San Francisco, with three World Series titles and four playoff appearances since 2010, had the majors' worst record at 11-23. The team got more bad news moments before the first pitch when All-Star closer Mark Melancon was put on the disabled list - though it's not as if he has had many ninth-inning leads to protect. Wheeler (2-2) went six innings in his best start since missing two seasons while recovering from Tommy John surgery. The right-hander was drafted sixth overall in 2009 and then shipped to the Mets for slugger Carlos Beltran in July 2011. T.J. Rivera had three hits for the Mets, including an RBI double in the second. The rookie fill-in for injured Lucas Duda also made a couple of nice plays at first base. Buster Posey homered for the second straight night for the Giants. Neil Walker keyed the first-inning outburst against Samardzija with a two-run triple on a sinking line drive that went under the glove of charging left fielder Eduardo Nunez, an infielder by trade. Jose Reyes added an RBI single and Rene Rivera had a run-scoring double, both with two outs. Conforto homered in the seventh off Samardzija, who eventually settled in. He struck out nine and walked none but was tagged for 10 hits and six runs. New York has scored in the first inning in eight of its last nine games, totaling 17 runs. Click here for more stories about the San Francisco Giants.